Kennel cough is a highly contagious disease caused by several viruses and bacteria. In puppies, canine distemper, canine parainfluenza virus infections are more common. Bortedella Bronchiseptica is most common bacterial cause of kennel cough in dogs who are under 6 months old. Puppies are more susceptible to environmental stresses such as poor , temperature and humidity. These factors play important role in primary & secondary infections, and can lead to bronchopneumonia (inflammation of the lungs and bronchus). Kennel Cough in Puppies Primarily Affects the Upper Respiratory Tract, but could move to the lower tract in severe cases. Puppies may severely cough, gag & choke when suffering from kennel cough. Tracheal or wind pipe palpation (toughing the wind pipe) may lead to cough. Vomiting along with convulsions after severe cough also represents kennel cough in puppies. Dry cough is common initially, but may develop to moist or productive cough later on. Productive cough also represents the existence of chronic infection and bronchopneumonia. Sound of Dog Kennel Cough. Note that Kennel Cough can sound like other types of canine cough. Kennel cough can be diagnosed by the clinical signs & symptoms, history & culturing of nasal swabs & discharge. Cough, if it persists for more then 5 – 7 days may be suspected to be kennel cough. 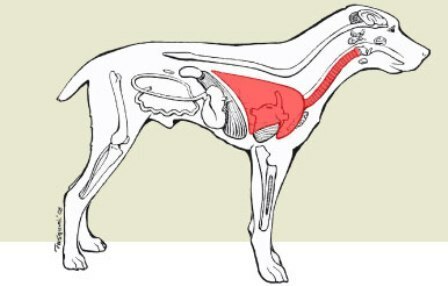 When mild palpation (touching of the trachea by the vet) leads to severe cough, it indicates the presence of inflammation in the trachea & bronchus; in other words kennel cough. Productive cough, severe illness & emaciation represent complications associated with bronchopneumonia. Antibiotics are usually administered for kennel cough. Puppies are more sensitive & responsive to antibiotics, therefore a thorough & complete diagnostic approach should be followed prior to the use of antibiotics. Screening & sensitivity tests are required in some breeds as collies (to see if your dog will have a reaction to the medications prescribed). Antibiotics are usually not effective for the bortedella species if given per the oral or intra muscular route. Aerosols of tetracycline & gentamycin diluted in 3 ml normal saline are most effective options to cure kennel cough in puppies. Cough Suppressants such as codeine & hydrocodone are effective in puppies but should be administered in low doses, repeated every consecutive days for a week. Special nutritional housing care is needed in puppies for early recovery. Poor care can lead to extended illness, complications & even death. For an added layer of support homeopathic remedies are available for puppies that suffer from kennel cough and other respiratory problems. One product specifically formulated for this purpose is PetAlive KC-Defense. It is made to naturally help dogs with acute kennel cough and other respiratory infections. Given the severity of kennel cough in puppies be sure to consult with a veterinarian. Puppies should be vaccinated for adenoviruses & distemper viruses by live virus vaccines. Initial doses are administered at age of 6 – 8 weeks, repeated at intervals of 3 – 4 weeks, until age of 14 – 16 weeks attained. A combination of live, avirulent (live microbial agent which can’t cause disease) B. bronchiseptica & modified parainfluenza virus vaccine is most effective, if used via intranasal route, in puppies of age less then 3 weeks.